I am thinking about a lift with the castors. No serious work just like to roll outside for cleaning and or painting the bottom. Also maybe stacking cars. That's about all the 4-post lifts are good for; I've had one for 25 yrs and never been able to do much work with it except for changing out rear exhaust on C4 Corvettes. 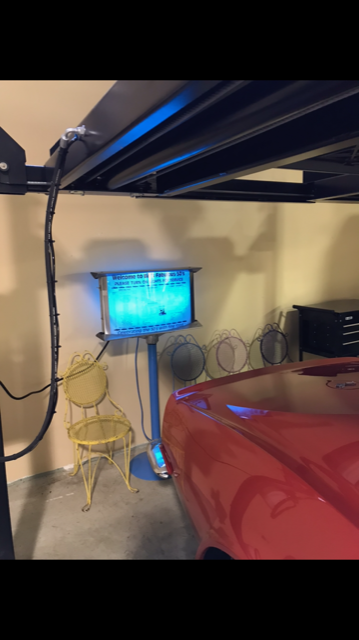 I purchased it for 'double stacking' Corvettes, but to stack anything other than Corvettes you need a really tall ceiling height, and you probably need it well away from the door to enable opening garage door with a car UP. You also need a pretty wide garage door to get them out and in. and they need a LOT of space in the garage. This last year I purchased a 2 post lift and they are much more useful for 'car work' (but not much good for double stacking!).. We have had one for about 10 years now and its been a great addition to the garage. Its really handy for pulling transmissions and doing maintenance items like fluid changes and greasing joints. We have a slider that goes in between the runners and a heavy duty bottle jack if a tire needs to come off for anything but its nice being able to raise the car to a easier working height. Young gun with a Camaro or 3. I have a 4 post, it works well for working down the middle of the car, everything is open and accessible. The rails are sometimes in the way when doing brakes and suspension work, I just position the car closer to the edge of the side I'm working on. I have a bridge jack that sits between the rails and slides the length of the lift, which is handy. I also built a tray that I can put a bottle jack on and slide between the rails. I bolted mine to the floor. The idea of having a car 6' off the ground and the lift not permanently attached didn't give me piece of mind. I've seen the demonstrations, engineers alot smarter than me designed them, but I bolted it down. I have had a 4 post for at least 15 years and love it. I can roll it outside and steam clean the underside of cars etc. Also have the sliding jack that lets me raise the front or rear ends. A couple years ago I bought a 2 post and found I hate using it. I'm getting old and cranky and to use a two post I am getting down on my knees to line up each lift pad at least 4 times. Much easier and less chance for error with a 4 post. You need 10' ceiling to be able to stack cars and need to move the door opener to the header. Thanks to all for your input. I do have the 10 foot ceilings already and the shop is so deep the doors won,t be a problem. I think Charley,s response fits my needs the best. I have 2 post lifts at the shop where I do heavy work. 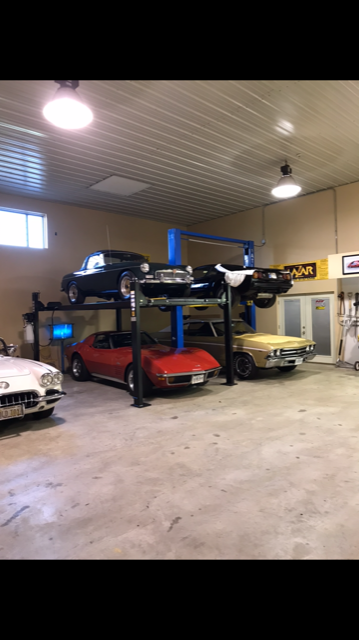 This shop is more where I store and detail cars. Charley do you have a brand or a picture? Thanks Charley, that BB model is expensive but seems the best. I am going to get a bendpak before spring. I liked where I could roll it around if needed and a dealer close. bestbuyautoequipment.com is where I got mine from. Good tip. What made you not get home shop 8k shown at $2595? I am just mostly cleaning, detailing, maybe oil change. I don’t remember exactly. I think when I got mine maybe jack tray came with one and not the other. 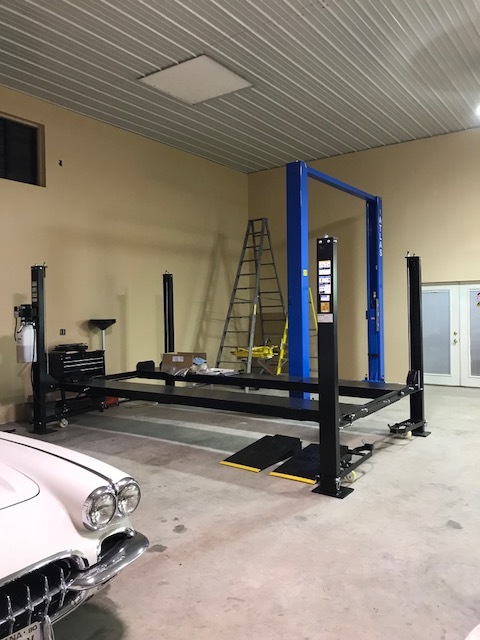 The Apex is also industry certified but I think the show (PRI in Indy) sale price on the upgraded one was just a couple hundred more than the hobby lift. Both looked certainly adequate. Many thanks guys. Think I will do the Apex. I am going to call them and tell them what I plan to do , might put my truck on it, and let them recommend which one. The price spread between all their 8k units is only $500. I like that theirs come with things that are options on others.